Darjeeling and Gangtok spell the magic on its visitors with the wide mountain ranges. It is an ideal destination for those who want to explore the serene beauty of nature. Tourists visit here to rejuvenate their senses with the most beautiful sights of lakes and mountains. Darjeeling, known as the Queen of the Hills is an ideal destination to explore adventurous sports, trekking as well as river rafting. People from all over the world come here to enjoy the ride with Toy Train. It is the most delightful experience to see the sunrise over the Kanchenjunga and Eastern Himalayas. 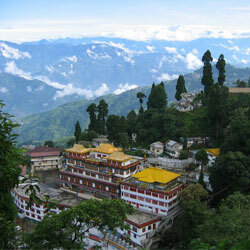 Similarly, Gangtok is a popular spot for lovers to explore snow-capped lofty mountains. The major tourist attractions are the Tshangu Lake, Gurudogmar Lake and Jelep La Pass. Prayer flags and holy chants are the signature sights of this town. It is also a renowned center for Buddhist pilgrimages. Explore the beautiful mountain ranges, as Indica Travels & Tours takes you on the exciting journey of major attractions of the North-East. We make your tour the most memorable experience in your lifetime. Our attractive Darjeeling and Gangtok tour packages will let you explore some of the wonderful attractions of the cities. On arrival you will be met and assisted to be transferred to Gsngtok by vehicle. Check into the hotel and stay overnight. After breakfast, start for an excursion to Tshangu Lake which is situated at a height of 12400 feet/ 3780 metres, with an average depth of 50 feet. The cool water of the lake is perfectly attuned with the scenic beauty around. Return to Gangtok and stay overnight at the hotel. After breakfast, go on a half-day sightseeing tour covering Jhakri Water Falls (4 hours) alonmg with Droul Chorthen, Research Institute of Tibetology, Directorate of Handicraft & Handloom and Flower Show. In the afternoon, transfer to Darjeeling (7380 feet / 2250 metres). Stay overnight at the hotel. Go on an early morning tour to Tiger Hills to view sunrise over Kanchendzonga Peak. On way back, visit Ghoom Monastery and Batasia Loop. After breakfast, sightseeing of Japenese Temple, Peace Pagoda, Padmaja Naidu Himalayan Zoological park and Himalayan Mountaineering Institue. Tenzing &Gombu Rock and Tea Estate. Overnight at the hotel. After breakfast transferred to NJP Railway Station/IXB Bagdogra Airport (100 km/ 3 to 4 hours). During these days you can enjoy and feel the beauty of Darjeeling and Gangtok in our Darjeeling and Gangtok Tour Packages.